The temperature can reach below freezing before there’s flower damage, while other variations can handle triple digit heat. They populate environments from tropical rainforests to the Himalayas to the tops of oak trees. The orchid family Orchidaceae ranks as the second largest family of flowering plants, and its species can be found growing all over the world. 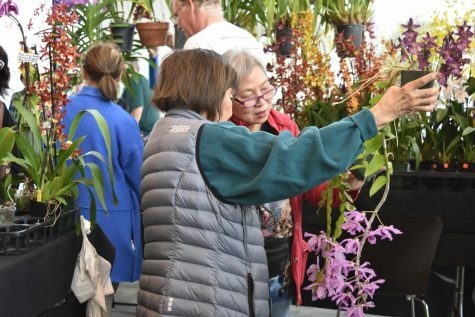 The non-profit volunteer organization Malihini Orchid Society is dedicated to appreciating and cultivating the diverse orchid species and hybrids, hosting its 2019 Annual Orchid Sale and Culture Demonstration on April 6 and 7. 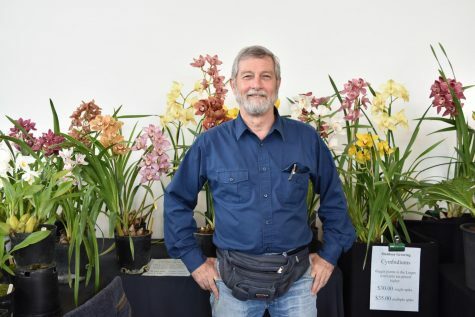 According to Bill Weaver, president of the Malihini Orchid Society, the club tries to hold a show or a sale at least once a year, and is one of several different orchid societies in the Bay Area. Although the biggest challenge is usually finding a place to hold the event, this year, they were able to easily find an open space at Main Street. Attendee Keenan Hampton enjoys events like these because the smaller venue allows buyers to have more direct communication with the people who grow the orchids, rather than the employees selling them in a store. Attendee Keena Hampton looks through the orchids for sale that are on display. 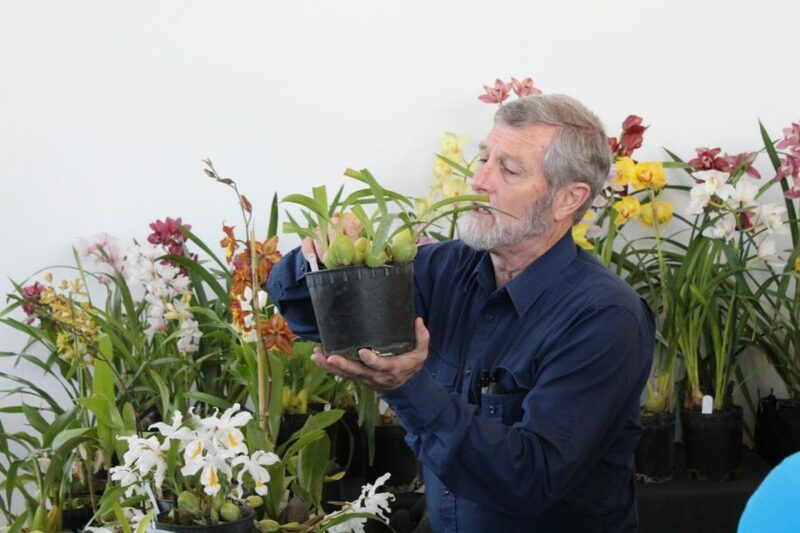 “I don’t like having to go through a store and having to ask people how did they care for these orchids to be told, ‘Oh, I just buy them from a grower,’ like, might as well go directly to the grower,” Hampton said. 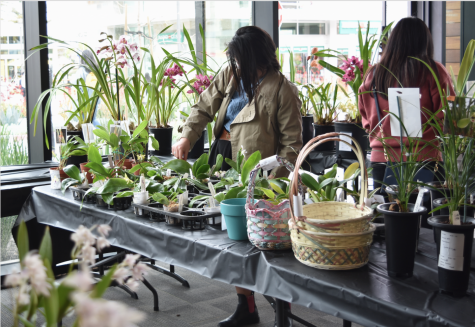 As part of the event, the club organized volunteers to run the event and four vendors, who are not necessarily members of the club, to sell the orchids. Dan Asbell, one such vendor from Asbell Orchids, was first introduced to orchids by his father, and for the most part, it was simply a hobby at the time. 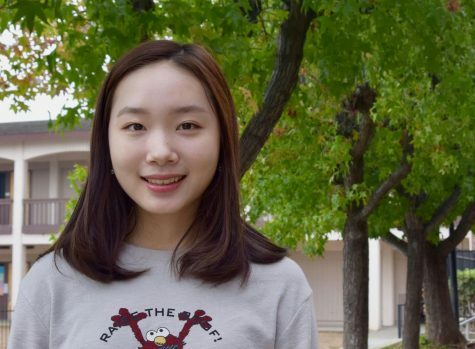 After his mother became sick, however, Asbell moved back to help his father take care of his mother, and the pair got back into hybridizing orchids, crossing plants from different species of orchid. It had initially been a retirement business for his father, but from there, they expanded. 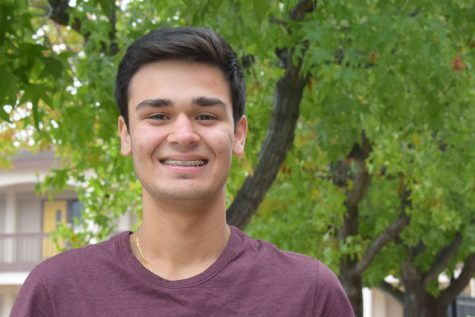 After cross pollinating a flower, Asbell waits nine months for the seeds to mature. Orchid seeds are unique in that they only have an embryo without an endosperm (the nutrient store in the seed that typically feeds the embryo), so they only have a size of around 50 plant cells. In the wild, only handfuls of seeds survive the process of germination, so Asbell kills the bacteria, increasing their germination rate to 98%. He then plants the seeds, never knowing quite what to expect. Vendor Dan Asbell displays orchids from his business hybridizing the plants. Although the day-to-day work of weeding and caring for the plants isn’t always exciting, Asbell always enjoys seeing the results of his work. However, it takes quite some time before they are visible. Despite being costly, there are many orchid enthusiasts who buy and plant them. 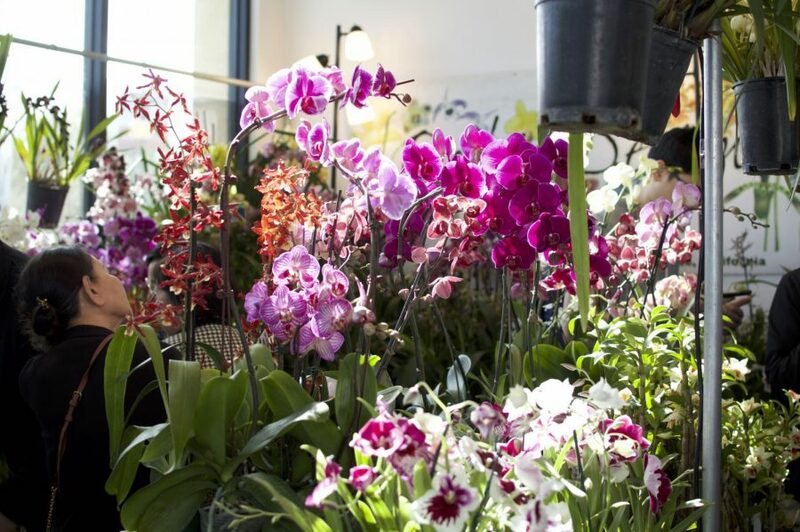 As both her mother and grandmother are passionate about orchids, Hampton has loved the plants since a young age. 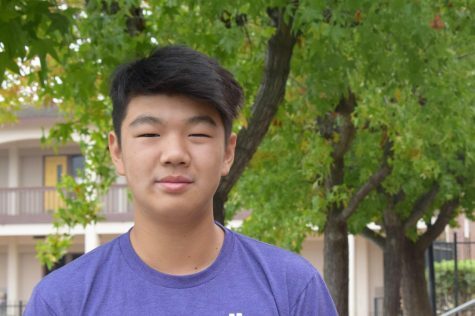 Weaver’s interest in plants and orchids stems from his childhood. 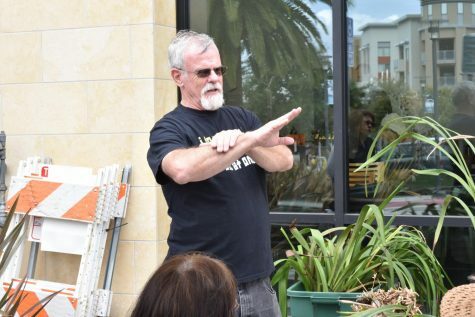 President of the Malihini Orchid Society, Bill Weaver, gives a demonstration on “How to keep your cymbidiums growing” outside the building. Weaver, who is now an expert on the species, admits that the majority of his knowledge about orchids came from actually killing them. As there was no internet when he bought his first orchids, he had to learn from his own experiences and ask others who were successful in growing them. However, even with his troubles in the beginning, what Weaver likes most about orchids is how little maintenance they require. He explains that they’re super simple to grow, as long as they’re not overwatered. 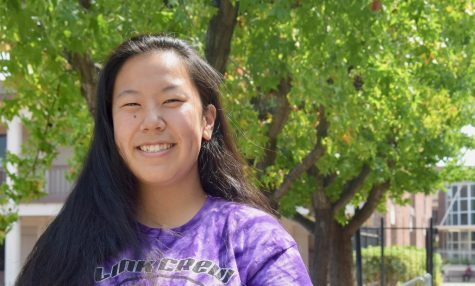 Similar to Hampton and Weaver, vendor and Malihini Orchid Society member Angelic Nguyen has also been interested in orchids ever since she was a little girl, painting orchids on silk and on dresses. Growing up in Vietnam, which is home to over 700 different species of orchids, the flower serves as a reminder of the country after she moved to the U.S.
Malihini Orchid Society board member Angelic Nguyen helps a customer select an orchid, comparing two different plants. 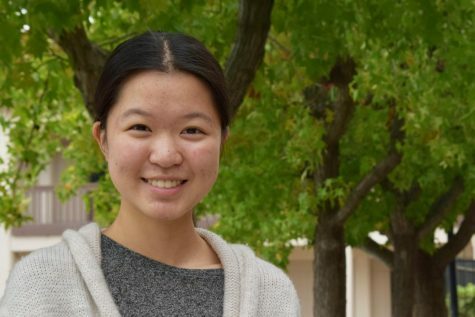 Following her aspirations, Nguyen began experimenting with planting orchids but, like Weaver, initially killed a lot of them. 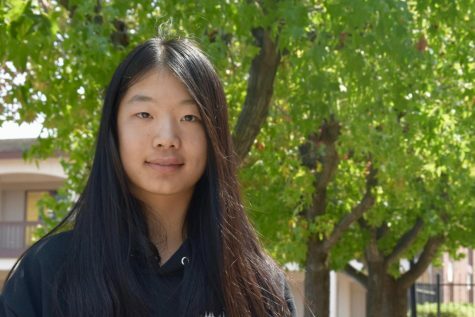 Realizing that she had to learn how to care for the plant, Nguyen joined the Malihini Orchid Society about 20 years ago. She now runs the business Orchid Design, and is now one of the board members of the Malini Orchid Society. The club holds monthly meetings where speakers come to talk about different parts of orchid culture, such as the genetics of orchids or the World Orchid Conference that was held in Costa Rica last year. Staff Member explains the basics of taking care of the plant he’s holding in his hand.